I got another three wins for the League against Philip, Mr Tiong and Jimmy today. Overall, I’m not doing too badly in this League, with only one 0.5 moku loss against Ho out of eight matches. The game against Mr Tiong today was especially intense. I started the game with slight inferiority, because I lost to him rather badly in the previous league encounter. 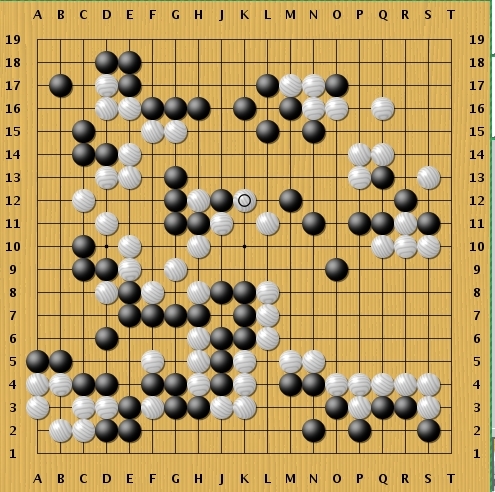 That was the game where I started behind in fuseki due to mistakenly choosing double hane variation to a 3-3 invasion which did not fit into my overall sanrensei strategy. Note : This particular post is to record my thought during the game against Mr Tiong today for my own future reference. It should be a very dull read to everyone else. Despite my loss to Mr Tiong in previous league, I got a higher rating and our rating difference dictated that I should play white and and give him 4 moku reverse komi. 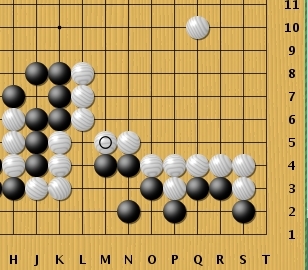 I knew from the very beginning that I had to attack hard, because Mr Tiong was so much superior in fuseki knowledge that plainly aiming for territory would be a sure fail strategy for me. Mr Tiong started with a Hoshi and a 6-4, where as I had double hoshis on the opposite site. He did not rush to make shimari but methodically extends to the sides and I followed similarly. 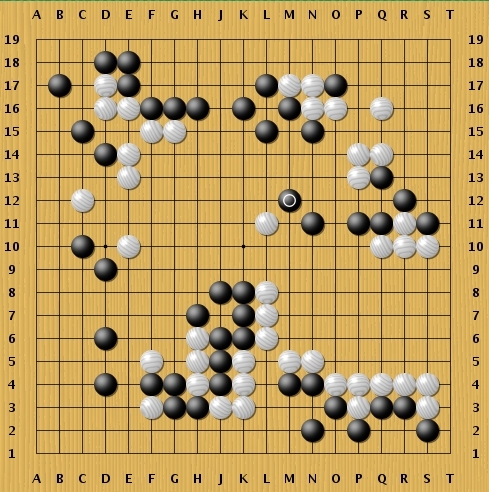 I would not make shimari from 6-4 as well, as there seems to be no good move to make shimari from a 6-4. After having extended to the sides, it came to a point where I had to do something about the 6-4 corner. From experience, playing hoshi against 6-4 will subject myself to double kakari and I would not like any outcome of that. Whereas, playing 3-3 would give him a nice influence and greater control of the centre for some territory points. That option was out of consideration as well. 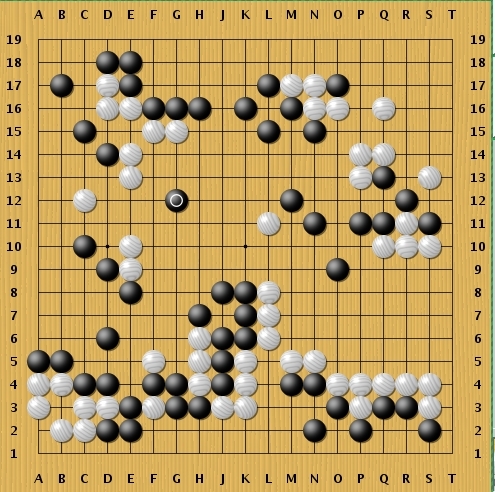 I needed influence and centre, to perhaps have the option to play moyo later if I came out behind in fuseki as normally the case against this particular opponent. Play normal, with moyo as fallback strategy. That was my mindset. So I invaded at 3-4 point, in the direction that threatens to slide into Mr Tiong’s more valueable framework. He strangely attached to my corner stone to protect that, and let me nobi to 4-4. This is too good for me, I thought for a while. But then another strange move followed. I found the marked move strange but not without merit. It appeared to me that he planned to play a tight game, with small territories everywhere. Anyway, the followup from here was bad from me. I really should get better result than what actually happened in the game. The game continued to be bad for me after I responded wrongly to Mr Tiong’s invasion at the bottom. I hardly had any moyo, there were so many points that black could invade and live prosperously. It was a wonder that I had any will to continue the game at all. I was not so keen on playing moyo anymore, so I invaded top. Wedge and sacrifice variation. I figured letting my opponent having ponnuki was justified as his top territory was already solid anyway. 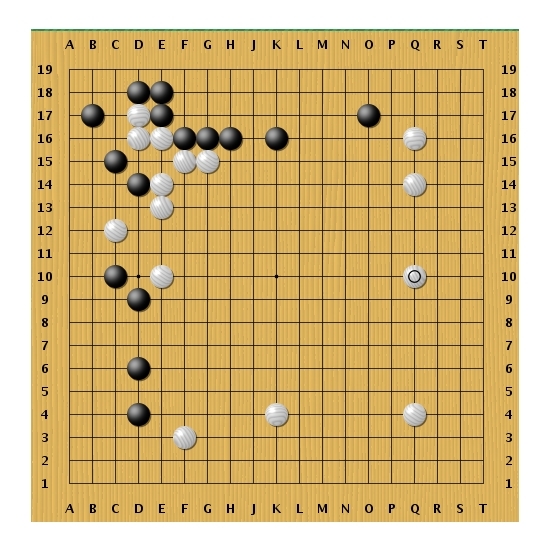 But Mr Tiong took this chance of sente to invade my moyo at the weakest point, 3-3. In the spirit of doing things the weird way, I did not respond the normal way, and the following resulted. 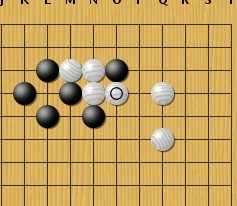 Nothing hurt more than having gote at the moment 😦 Anyone could easily guess where black was going to play next. 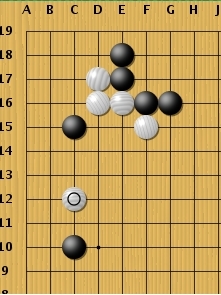 Yes, black invaded the right side. I was so behind in the game that it was not funny! Somehow later, I won this match and was pleased with myself, but right now in reviewing mode, I am just puzzled as to how on earth did I play so badly. Anyway, back to the game, I invaded at sansan, but pushing at E9 first because I was quite concerned with the safety on the top left group. Spending another move on the right was too expensive, so I decided against it. I managed to live small in the corner. Some exchanges then happened on the right and finally black decided to attack the weak group! The following sequence occured. I tried to attach against his stones to find a way to settle myself. 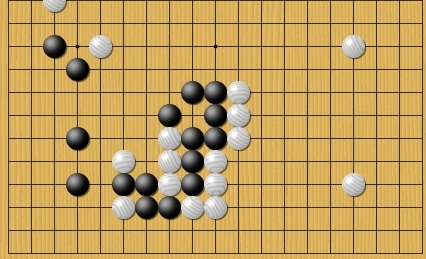 Black had just missed a large scale attack by playing the marked move. 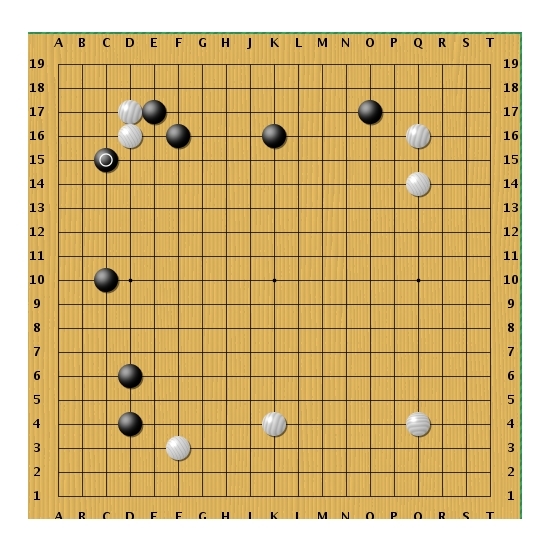 Of course, there was possibility of white playing there, and save the H5 group with sequence White F7, Black G6, White E6, Black D7 and White G5. But understandably, large scale attack was not needed at all. Wrapping up game quickly would be better. By this time, I have started eyeing the opponent’s right side group. 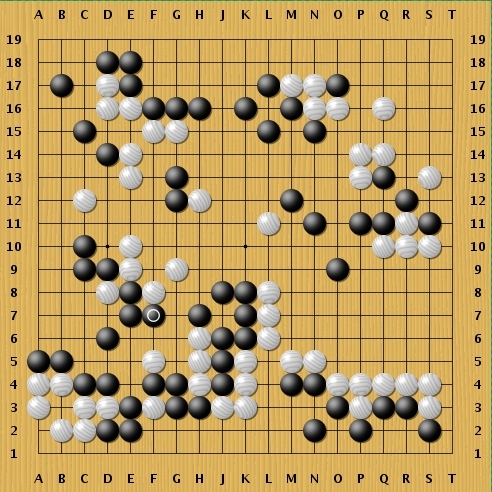 I wanted to have a double attack against black’s right side and middle groups. I was hoping for my opponent to cut at J10, and voila, it came 🙂 The response to J10 was White J9 and sequence followed Black K11, White K9, Black J7 and White L12. Reviewing this game, I realise how weak I am at fuseki. I made so many mistakes in the beginning, but luckily Mr Tiong made some very costly mistakes at the end. I rely too much on big mistakes by my opponents, that has to change ! Yea, I know that I’ve been away for too long. I’m starting to miss the Japanese players in JC and also the freedom to play Shogi any time I want. I haven’t been playing Shogi that much except solving 50 tsume shogi every night and read a few page about strategies. I did not prepare anything but I am going to improve my skills so I could try and win the professional 4-dan player. If I could win him, it would really be a great motivation for me towards becoming a pro. How about you? It seems you have been seriously studying Go at the moment. Good luck with it! 50 is a lot. I’ve tried 20 tsumego per day, and always quit after 2-3 days. im not really studying Go, just play a lot more than usual. that’s more effective i believe..
who and when are you playing this 4 dan pro?